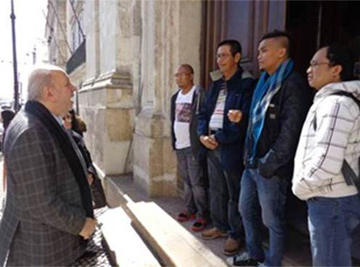 The Philippine Embassy in Lisbon, Portugal headed by Philippine Ambassador to Portugal and PJLI Chairman Philippe Lhuillier visited the 13 Filipino crew members on board the damaged chemical tanker MT Harbour Krystal to provide assistance and counselling. According to the report of the Maritime Rescue Coordinating Center (MRCC) Lisbon to the Embassy, the 11,262 dwt (dead weight tonnage) Bahamas-flagged chemical tanker owned by Nordic Tankers of Denmark suffered an explosion in the early morning of March 06 in the forward compartment of the ship while it was anchored in the Port of Setubal in Portugal. The explosion caused a huge fire in the ship carrying a cargo of light virgin flammable liquid called Naptha. The Filipino crew shared their frightening experiences during the incident to Ambassador Lhuillier and narrated how they survived.